The last time I visited the Wonderland Boutique there wasn't much there, so I took another look today. Here are some things I liked. I managed to get big versions of these so you can see enlarged versions by clicking the images. 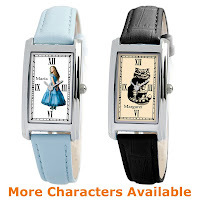 Create-Your-Own Alice in Wonderland Small Watch for Adults - I like rectangular watches, and I'm really into the Cheshire Cat from the movie, so this looks like a cool watch. These can be personalized quite a bit. You choose the style of watch, what image goes on the face, what wrist strap you want, and then you can also get your name printed on the face and something engraved on the back. Keyhole Alice in Wonderland Bangle Bracelet by Tom Binns for Disney Couture - I'm a sucker for blue and think that this bangle looks cool. It's just got a certain feel to it. 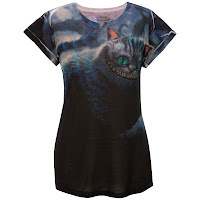 Cheshire Cat Alice in Wonderland Tee for Women - See a pattern yet? I'm all about the Cheshire cat, I admit it. I also like a more "normal" tee shirt, although they have a lot of T-shirt options. 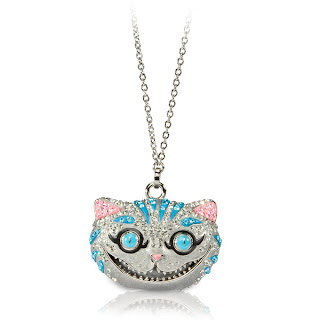 Cheshire Cat Alice in Wonderland Necklace by Swarovski - Sadly, my favorite thing in the store isn't available for purchase yet. This thing is SO COOL. This necklace has a charm at the end of the extender: a Cheshire Cat tail. It's kind of like a scary mask. If you all were planning on buying me a birthday present, here's an idea for you.